Report by Mike Goodman from Off The Wall. Having completed my first full year of heritage tours, taking people around the north of the county showing them a full range of topics from; stone circles, Romans, dark age warriors, reivers and much more as I researched for my tours especially for the spooky tours I became aware of the wealth of legends and stories that abounded in our area. 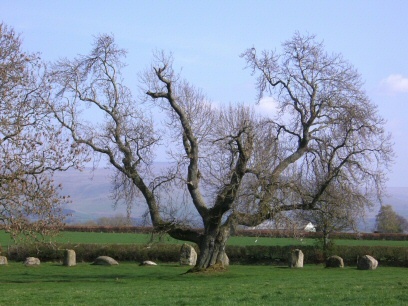 I can think of no other area which can boast stories legends and supernatural events that north Cumbria can show. Indeed I sometimes think of this as our Bermuda triangle, an area stretching along the river Eden valley from its source in the Pennines to its meeting with the Solway Firth, south to north, east to west by the Pennine hills to the Cumbrian mountains, in this area strange tales and legends abound, many stone circles are found here all rich in stories involving Witches, wizards and legendary kings. Travel along the very quiet back roads of the Eden valley travelling through villages and hamlets rich in stories of Vampires (beware one inhabitant of this particular village, upon completing my Halloween story on the Croglin vampire which for dramatic effect I told inside the church yard in the dark, telling my guests that the actual story belongs to a farm about a mile away downstream of Croglin beck a private farmhouse, after completing the story we all climbed aboard the two buses as the last person aboard I was approached by a local resident and asked what I was doing, I explained what we were here for, thinking he would smile and wave us on our way, instead I was told to b****r off with your stupid stories I don’t want you round here, thanking him for his warm welcome I climbed aboard our bus and set off with the said gentleman waving us off in a not too friendly way, I have often wondered why nothing more has not been done in the village to promote people to call and discover the legend for themselves perhaps that was my answer from this unfriendly man). Many more stories can be found involving prehistoric animals, man eating giants and much more, you can find stories on mythical creatures such as fairies and Boggles, there is also the natural phenomenon of the Helm wind which blows mysteriously between the Pennines and the Eden. Did you know that one of the Pennine hills now called Cross fell used to be known as fiends fell, I wonder why? Did you know this area is rich in stories involving King Arthur and the knights of the round table, Pendragon castle lies just south of Kirby Stephen, Arthur’s round table a round henge just outside Penrith, Tarn Watheling outside High Hesket , Carlisle is one of the places named as a possible Camelot, and of course Arthuret church Arthur’s possible burial place. Ghost stories also are to be found all over our area.